The Nexus between Loan Portfolio Size and Volatility : Does Banking Regulation Matter? Franziska Bremus received a master’s degree from the University of Québec at Montréal in 2006. 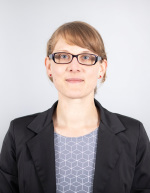 She graduated from the University of Tübingen as Diplom-Volkswirtin in 2008 before joining the DIW Graduate Center. Since 2009, she supports the departments of macroeconomics and forecasting. In her dissertation, she dealt with the interactions between macroeconomics and financial markets. Fields of interest: macroeconomics, real-financial interactions, international banking.